There's something to be said about the particular style of British eccentricity. I'm sure all nationalities have their eccentrics, but British eccentrics are for the most part quite endearing in their nuttiness. I have faint memories of Eddie "The Eagle" Edwards from the 1988 Calgary Winter Olympics. From my childhood memories, Eddie the Eagle was suppose to be a spectacular failure in his sport of ski jumping, but one who won the hearts of the world because he just kept trying despite a total lack of talent or logic. Despite all sense, despite all the obstacles Edwards faced, he cheerfully plugged along, perhaps oblivious to the fact that he was dreadful in what he loved to do, or even aware of it but his enthusiasm making up for his skills. 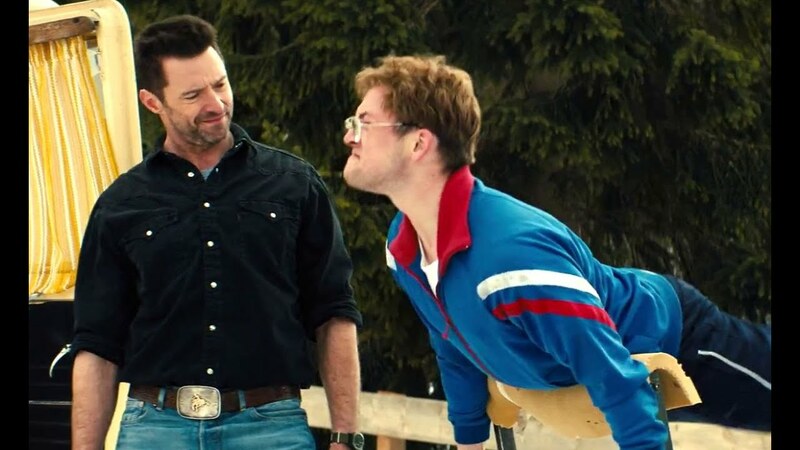 Now, nearly thirty years later, the merry adventures of Eddie "The Eagle" Edwards make their way onto the big screen, and Eddie The Eagle, like its eponymous hero, is delightful, sweet, inspirational, and unapologetic about it. Michael Edwards, better known as Eddie, has great dreams of being an Olympian. He's not the most skilled or athletic person in Britain, having dodgy knees, poor eyesight, and no real physical strength or talent. His mother quietly supports his dreams, vague as they are, while his plasterer father wished Eddie would just grow up and get on with following in his footsteps into something respectable. Eddie tries hard to improve his skills at Summer Olympic sports (hurdles, javelin), failing spectacularly each time. He reluctantly agrees to give up his dreams and go into plastering with his father, but as fate would have it, Eddie sees a manufactured ski slope and realizes he's been chasing the wrong season. He WILL be an Olympian, but a Winter one. It's now 1987. 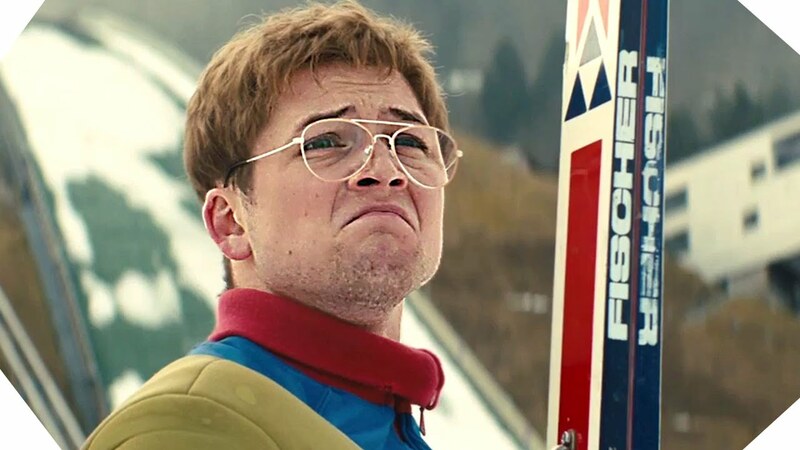 Bless Eddie (Taron Egerton), who dons skis and works constantly to make the Olympic ski team, much to the frustration of his father and worry of his mother. After inadvertently making a mockery of the British Ski Team presentation, he's told in no uncertain terms he is no Olympic material. Fate takes another turn, when Eddie discovers that there is no British Olympic ski jumping team. The last time Britain was represented in this sport was in 1936, and in those years the rules were never updated. As a result, a loophole allows anyone who successfully lands a 38 meter (125 foot) jump to automatically be the British Olympic ski jumper and thus, an Olympian. Taking this as his cue, Eddie casually takes off for Germany to train, horrifying his parents who are astounded at how he could just pick up and go. With no money to live off, let alone train, Eddie finds it a hard go, but Petra (Iris Berben), the local tavern owner who takes a shine to Eddie, allows him to stay in exchange for his working there. Eddie finds everyone pretty much dismisses him as either an idiot or a lunatic, including the training groundskeeper Bronson Peary (Hugh Jackman). Eddie learns Bronson was an American ski jumping wunderkind who fell out with his coach due to Bronson's drinking, lack of discipline, and arrogance. Seeing how Eddie continues despite all the mockery, Bronson eventually finds a kindred spirit and helps train him. To the horror of the British Olympic Committee, Eddie manages to land that required meter jump and is technically an Olympian. They attempt to circumvent him by raising the stakes: he must land a 61 meter (200 feet) jump in an officially sanctioned European event (think of it as the #NeverEddie Movement). Despite Eddie's protest that he met the requirements as stated in the rules and that the Olympics were meant for amateurs, the BOC stubbornly plots to stop him making the entire British ski team look foolish. Not one to back down, Eddie goes across Europe, competing in every competition he can get to, with Bronson now on board (reluctantly). Despite many obstacles, it looks like Eddie has finally made it, only to find that in the final qualifying jump, he falls. Dejected, he decides that it is the end...until the excessive efficiency of Germans ("We do EVERYTHING by the book", they keep repeating) shows that one of his jumps, where he landed 61 feet exactly, qualifies. Michael "Eddie" Edwards, having met the qualifications set by the British Olympic Committee, will represent his Queen and Country in Calgary...and there's nothing the BOC can do about it. There is something his fellow Olympians can do, which is make his life miserable. Eddie does not drink alcohol at all (and milk whenever he trains), but they pressure him to share a series of toasts as "tradition", which makes him miss the Opening Ceremonies. Again and again no one takes Eddie seriously; Bronson, who had urged Eddie to wait until the 1992 Games, had refused to go to Calgary and had a falling out with him fearing Eddie would become a laughingstock. At his official competition, Eddie jumps 60.5 meters. Never mind that he comes in dead last. Ever the optimist, Eddie is thrilled beyond measure that he has set a British record and made his Olympic dream true. His enthusiasm in infective, beginning to flap his arms in celebration, oblivious to having been in almost every other respect a complete fiasco. The BBC announcer (Jim Broadbent), so overcome with the sheer spectacle of his happy man despite his failure to come anywhere close to a medal, dubs him "Eddie the Eagle". Bronson, for his part, is not amused, and Eddie sees that he is seen as a joke (one sports commenter dubbing him "Eddie the Penguin"). While he gains millions of fans, Eddie is set on being a serious Olympian. With that, he announces to the press (who have fallen in love with him) that he apologizes to the BOC for bringing any disrepute to them or the Olympics over his antics (harmless as they were). He also announces he came to be a serious athlete...and will jump the 90 meter jump (which he's never done before). The world is stunned...and Bronson is terrified Eddie will get killed. He goes to Calgary but rather than dissuade him, he lends his support. With the whole world watching, Eddie makes the jump...setting a new British record of 71.5 meters. Once again dead last, the world simply does not care. Eddie The Eagle has gumption, enthusiasm, and joie de vivre. At the Closing Ceremonies, the President of the Olympic Committee comments that in these Calgary Games, some competitors had won gold, some had broken records...and some have even soared like an eagle. 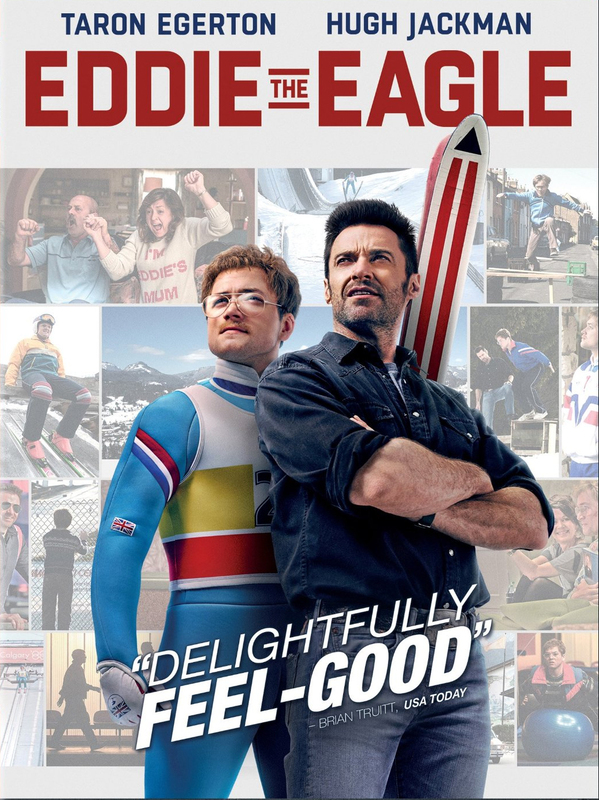 Eddie the Eagle is just like the title character, a joyful product about that curious British quality of "victory in defeat". It is a testament and tribute to 'bulldog tenacity', that ideal of pursuing a goal/dream despite all opposition or even self-awareness. The best quality of Eddie the Eagle is in Egerton. It is astonishing to think that the young man who was the (quite glamorous) face of Kingsman: The Secret Service could pull off the challenge of playing a virginal, slightly clueless, innocent man, one who not only drinks milk but is unaware why anyone would think it strange that he does so at a bar, one who is shocked to find naked men in a sauna, and one who doesn't understand why same said men would think his Olympic goals are unrealistic. Egerton has an extremely difficult task as Edwards: he has to make his naivete and sincerity come across without making Eddie look like an idiot. Egerton succeeds beyond anything one would have thought possible. It isn't just in the physicality that Egerton has: the way he holds his head, the awkward nature to his movements. It's also in the emotional aspects, and this is where Egerton shows that not only was he the best choice to play Edwards, but that Taron Egerton may be becoming one of our better younger actors. He never makes Edwards look like a buffoon, but instead makes Edwards a permanent dreamer, who truly believes that hard work and an undying optimism will win the day. Egerton brings out a man thrilled in making his goals reality. For Edwards, winning an Olympic gold medal was never the objective (nor was winning silver or bronze). It was in just getting there, of being. It is such a wonderful, delightful performance, and while I get the sense it will be forgotten come Oscar-time, it is one that certainly deserves a second look. Hugh Jackman reminds us that he is more than Wolverine. He also shows that unlike his compatriot Chris Hemsworth, Jackman can actually sound like an American. Sure, his character is perhaps a stereotypical one (gruff loner who learns to embrace the goodness of people), but he plays it well and we can see the evolution of Bronson from man who dismisses Eddie to one who embraces him. 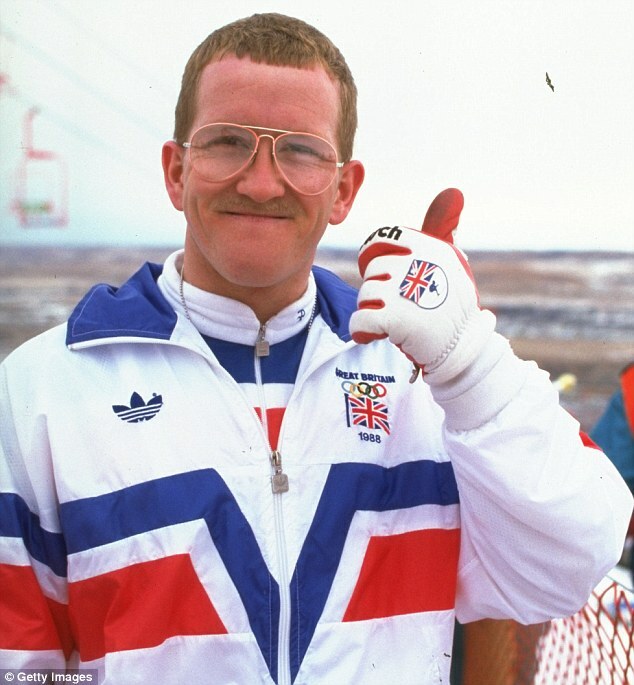 In many ways, Eddie the Eagle is pretty much standard 'inspirational' fare. We have moments of comedy (in a training montage, Bronson encourages Eddie to picture love-making to his favorite film star, Bo Derek, complete with hints of Ravel's Bolero...though whether Bronson is aware Eddie is a virgin we're not sure). We have those training montages (complete with music). We have the Establishment opposing him, the parents split on supporting/opposing their son, the former villains turning around to see the true heart of the athlete, and even a nod to the Jamaican bobsled team (another group of curious participants in Calgary). Still, we can't help but fall in love with Eddie the Eagle and Eddie the Eagle. With an absolutely brilliant performance by Taron Egerton, this is simply one of the best films of 2016, a bright shining light in a season of horrors. What's It All About, Oscar?